Our Count Your Blessings necklace will be treasured for generations. The word "blessed" is engraved on the back of the necklace for added meaning. The five stone bar is perfect for the grandmother of five. Stylish bar necklaces can be seen in magazines and on celebrities. 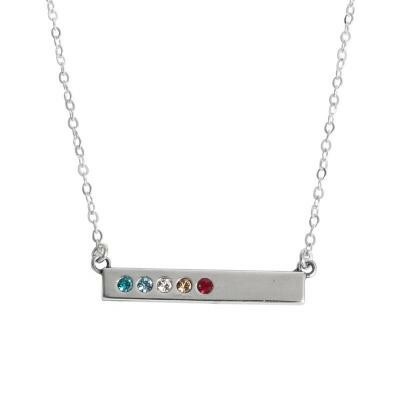 Nelle and Lizzy's birthstone bar necklace takes the concept a bit further and adds meaning to ~ each birthstone represents a family member and creates a simple and sophisticated grandmother's necklace. To top it off we added the word "blessed" to the back to remind you of how blessed you are. How many blessings can you count? On this simple necklace you can count up to five grandkids or all the members of your family! Each birthstone can represent someone you love. You can put just the birthstones of your kids or grandkids or you can include mom and dad too. This five birthstone necklace is perfect for the grandmother of five. We only use sterling silver, 14K gold, gold filled, 14K gold vermeil and bronze in our products.